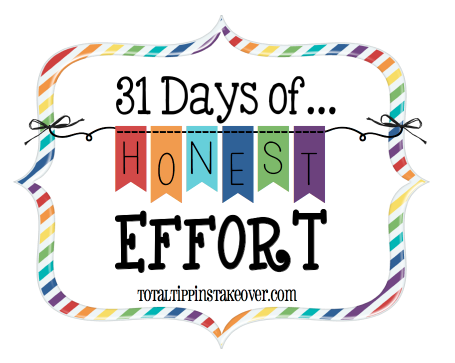 this is day four in the series "31 days of honest effort"
today was one of those days that was lazy and yet busy all at the same time. do you ever have those? we had another long night (thankyouverymuchlaney) so morning came all too quickly. we were a little slow going this morning, but eventually made our way to the library. my girls LOVE going to the library. they take after their momma's bookworm heart. i have such fond memories of my mom taking me and my brother and sister to the library as kids. our library had a limit to how many books you could check out at once and i always seemed to find just one or two more than what the limit was. i remember bargaining with my sister to check out some books for me since she never seemed to fill her quota (i mean, really...there were only so many ninja turtle books she could find in one visit). i also have a *vague* memory of being in college and receiving a certified letter over some (long) overdue books. apparently they take library fines very seriously. who knew?! needless to say, i'm happy to pass on my love of books (not the overdue kind) to my girls. they enjoy going to the library and checking out books more than they enjoy the story time or special character days our library has. and i truly enjoy taking them, but i'm not going to lie - it's exhausting. libbi does pretty well with finding her books and playing quietly on the computers. but laney? not so much. she doesn't know the meaning of "inside voice".... in fact, i'm pretty sure she doesn't even HAVE an inside voice. and no matter how many times i say, "laney, i'm going to be right here by this shelf...." it never fails that two seconds later she's yelling, "MOMMA! WHERE ARE YOUUUUUUU?" and then she laughs every time she sees me and says "I FOUNNNNNNNND YOU!" like i've been hiding from her while playing a super fun library hide and seek game. um, no. today's trip was no different. libbi played and read quietly, laney tried to "find me" the whole time, and liza just chilled in the stroller. once we find our books. the girls help me check them out at the "Self Checkout" and then we're on our way. they're usually smiling and i'm usually sweating - ha! but we're all happy with our haul of books and excited to get home and read them together. i love seeing my girls start to enjoy literature and recognize titles and characters. it makes me happy that they have favorite books that they request to have read to them over and over until they can recite them by heart. hopefully one day, they too will have fond memories of library visits and more importantly a lifetime of reading! "Keep these words of mine in your heart and in your soul. Tie them as something special to see upon your hand and on your forehead between your eyes. Teach them to your children. Talk about them when you sit in your house and when you walk on the road and when you lie down and when you get up."